SpeakAP is a fun little app for Android, iPhone, and iPad that offers a useful angle on pronunciation of individual words. Unlike software that seeks to tell you if you’ve matched the individual sounds in a word, SpeakAP focuses on the timing, intensity, and pitch of syllables in single words. This is a particularly good app for working on producing clearly marked word stress, because stressed syllables last longer (timing), are pronounced with more force and volume (intensity), and involve a change in tone (pitch). The app is produced by a firm that builds speech therapy technology, Aventusoft. When you practice a single word (and there are several hundred on the first basic list), you see three graphs–one of volume over time, so you see the duration and loudness of each syllable, one of intensity over time, which is a similar measure represented by a continuous line, and then one of pitch. There is an original recording (which you can listen to) represented in blue, and then your recording is represented in yellow. 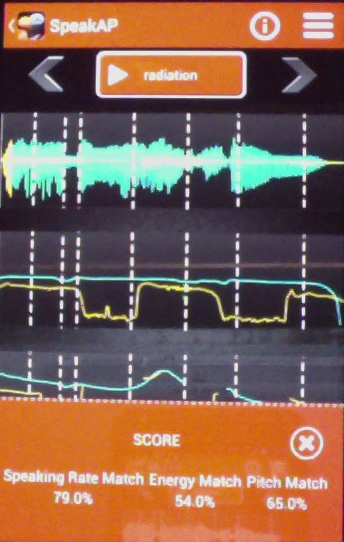 You also get a percentage “score” as to your match to the reference recording on each of the three scales. 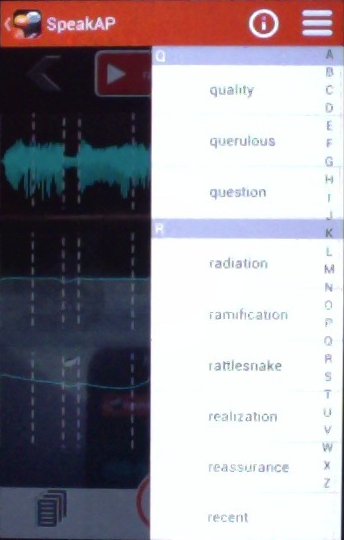 In this snapshot of my recording of “radiation” as ray[pause]-dee[pause]-yay[pause]-shun, you may be able to see down at the bottom of the screen that I got 79% speaking rate match, 54% energy match, and 65% pitch match. You can see in the middle graph in particular that my voice turned on and off because of the pauses in the word. While the app suggests aiming for at least 75% match in all categories, I found that In my experience with the app, pitch seemed to be the most sensitive score to incorrect syllable stress placement, and my “intensity” score was always low. The images of the three superimposed graphs gave me more useful data than the percentage scores. You can pick a word by clicking on the three-bars icon at the top-right of the screen, or you can just take the next word in the queue. As you can see in this picture of me picking out the word “radiation,” most of the words on the basic list are multisyllabic and at least somewhat academic. There are word lists and idiom lists; unfortunately, only the wordlists supply feedback. The app itself is free on all platforms. In the Android version, the long basic list is free. It looks like the basic list costs $1.99 in the iPhone and iPad app, but double-check that on your device. If you try this app, add a comment here to share your experience. Categories: Android, iPad, iPhone, Suggested Apps | Tags: Android, emphasis, graph, intonation, iPad, iPhone, Mobile app, pitch, pronunciation, rhythm, Speech-language pathology, speed, Stress, Syllable, syllable stress, tone, visualization, visualize, vocabulary | Permalink.